Hey, I have to share what I spotted over at Target. I ran over during my lunch break and I needed to pick up a few things in Christmas candy section. The one side of the aisle is your typical bags of reeses, snickers, hersheys etc, but the other side is the more "sophisticated" stuff like Ghiradelli and whatnot. Well, what do I spy near the bottom but some rather large hexagon-ish boxes with pictures of ice cream on them. 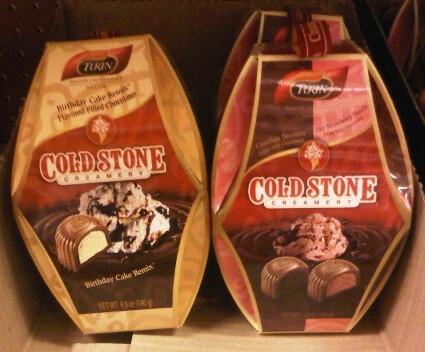 Check out Cold Stone Creamery Flavor filled chocolates! There were about 8 boxes of "Chocolate Devotion & Our Strawberry Blonde" and just one box left of "Birthday Cake Remix". Actually, I didn't even notice that the one box was half and half. Now this is the first time that I've ever seen these, but according to the press release, they were announced two years ago (Nov '08). They mention that these are technically available year round and can also be found in the flavors "Coffee Lovers Only", "Chocolate Devotion", and "Peanut Butter Cup Perfection". Note: If you go to Turin's website (they are out of Mexico), you can see ice cream truffle collection sans Cold Stone branding. Not picking, I just always get a kick out of that stuff. I had some last year. They were okay, but nothing special. Cheaper chocolate, with a tinge of plastic in the back. Save your money and eat something worthwhile when it comes to chocolate.